The photograph shows two 68-pound Russian guns captured at the Siege of Sevastopol during the Crimean War. 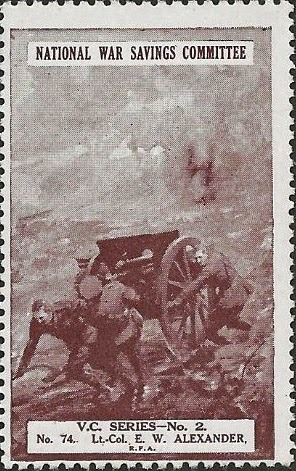 The 68-pounders were naval ordnance, which were used as artillery on land after the Russians scuttled their ships of the Black Sea Fleet. My father played on these guns as a child, but they were removed and melted down in 1940 in support of the war effort. 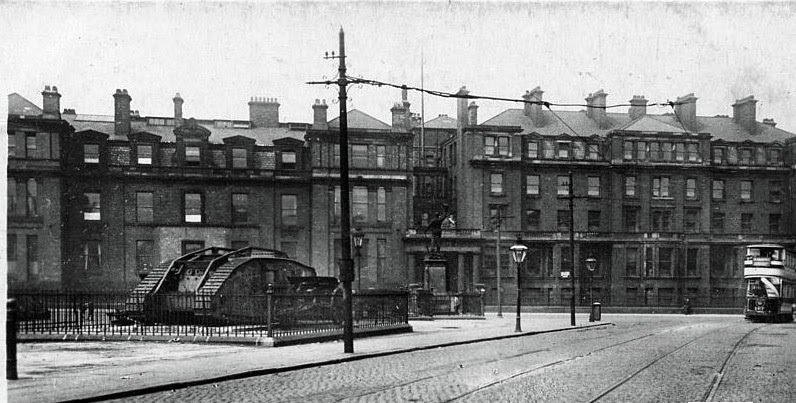 They were surrounded by chevaux de frise, similar to the captured guns once displayed in Kelvingrove Park, Glasgow. 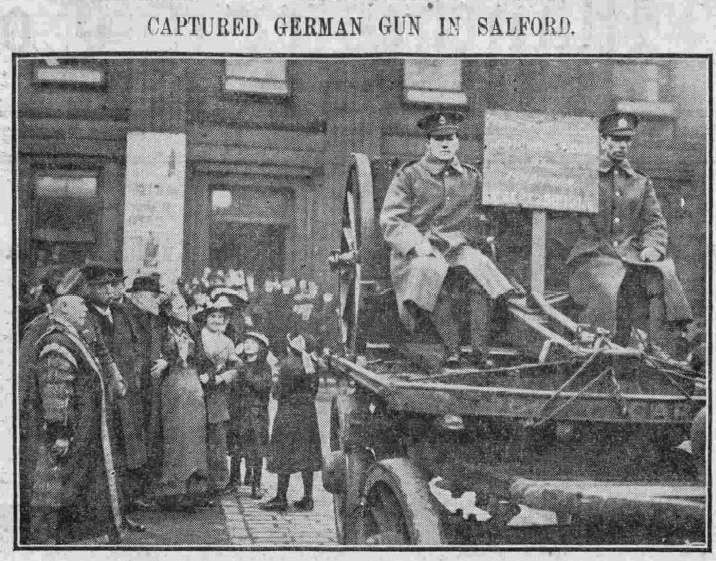 In 1919, Salford was presented with a British tank and two German field guns, which had been captured at the Battle of Loos. 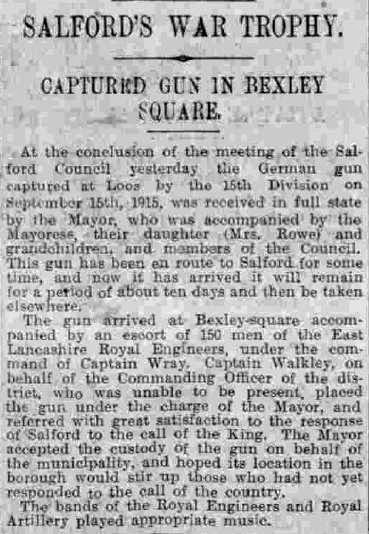 They were given by the National War Savings Committee in recognition of the financial support provided by the citizens of Salford. 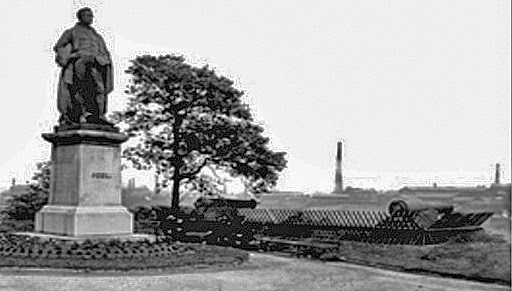 “The decision in favour of cleaning away the tank … will be welcomed especially by members of the Labour Party and other suporters of the anti-militarist movement ... the Museum and Parks Committee will lay out a shrubbery turning what was described as an ‘eyesore’, and reminder of the horrors of war, into a pleasant spot." The park railings were removed too. See: Zieleniec, Andrzej Jan Leon (2002) Park spaces: leisure, culture and modernity - a Glasgow case study. pages 322-323. While most British examples of Crimean War cannons were melted down, some in Ireland still survive.